Anyone who enjoys a delicious steak knows how important it is to have the proper steak knife. Nothing is more disappointing than eating a delicious, perfectly cooked prime cut of beef with a regular table knife. To truly compliment your meal and take the experience an extra mile, a good steak knife is very important. The best steak knives feel sturdy in your hand, look great, and most importantly cut through any steak with ease. View this week's best deals on the best steak knives! Anyone who has ever enjoyed a steak using proper steak knife will tell you what a great difference there is in using a good steak knife. It compliments and shows the meat that you are eating respect, while allowing you to enjoy the succulent pieces of your steak, cut with ease with an amazing steak knife. And you don’t have to spend a fortune to get one! 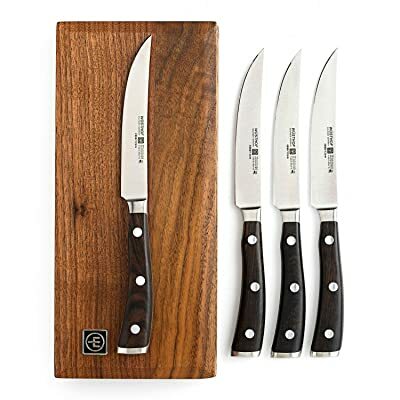 Some steak knife sets could be yours for as little as fifty dollars, while spending hundred dollars and up will provide you with some of the best steak knives out there, forever changing the way you it your steak! 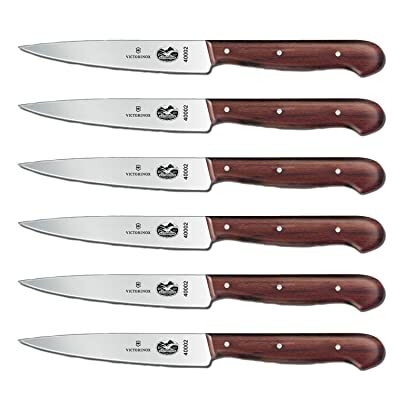 This set of knives is basically a “budget” version of the previous, “Classic” 6-piece wusthof steak knife set. The main difference lies in manufacturing – the Classic knives are forged, and the budget versions are laser-cut. Steel that has been forged will result in much more durable, sharp, sturdy knives. And that is usually reflected in the price. For me, there is a minimum quality expectation when it comes to steak knives. Of course it has to be sharp enough to effortlessly cut through a nice steak, no matter the cook on it. This sharpness has to be retained without your knife dulling down after a few meal. The knife should feel comfortable in the hand, not too flimsy (like the cheaper knives that have a terrible ‘plasticy’ feel to it. It feels absolutely amazing to hold a proper steak knife, what is there to say about cutting through a delicious piece of steak. So this set here was my first ever steak knife set which had finally met (most) of my expectations. Those knives are of quality steel (even though laser-cut and not forged) and an infinite leap up from generic steak knife brands. While there are more expensive steak knives available, I would say this steak knife set is quite a good place to start. Some people report these knives having issues after a year or more, I’ve only used them for about six months after getting another set of steak knives, so I’ve only had positive experience with those knives. Sizzling steak hot off the grill is even more enjoyable when effortlessly sliced with the proper cutting tool. This steak-knife set by Wusthof features six 4-1/2-inch steak knives. Each knife provides a sharp blade with a pointed tip that makes it easy to cut thin even slices without tearing or undue pressure, which can cause juice to escape from the meat. A great wedding- or housewarming-gift idea, the steak knives measure approximately 9-1/2 by 1 by 1/2 inches each. As part of Wusthof’s Gourmet collection, each knife features a special blend of high-carbon German stainless steel throughout the whole length of the knife for exceptional strength and balance. Wusthof knives also provide sharp, precisely tempered blades for safe, efficient use. Laser tested for accuracy, the unique, compound angle of the blade tapers from the spine of the knife to the edge to create a sturdy, yet extremely sharp cutting surface. Another thoughtful detail includes the handles, which come riveted and ergonomically designed for a secure, comfortable grip. Made in Solingen Germany, “The Cutlery Capital of the World”, Wusthof knives carry a limited lifetime warranty and should be hand washed for best results. This set is one of my favorites, those Victorinox Steak Knives are extremely sturdy and feel quite big in your hand. Those are for serious meat-eaters only! Those steak knives are a classic, and have a rustic feel to them, going well with a county-style setting rather than having a delicate feel to them. The quality of those Swiss-made knives speaks for itself, with those knives sure to serve you cutting delicious pieces of meat for years to come! Those Japanese steak knives have an extremely cool, sleek look to them, feel balanced to the hand and are impeccably sharp. Those high-end knives are a worthy investment if you are considering buying a steak knife that won’t break or chip after a few years, but will last and bring you and your close ones joy for years to come! Steak lovers know: The perfect steak should be juicy and tender. 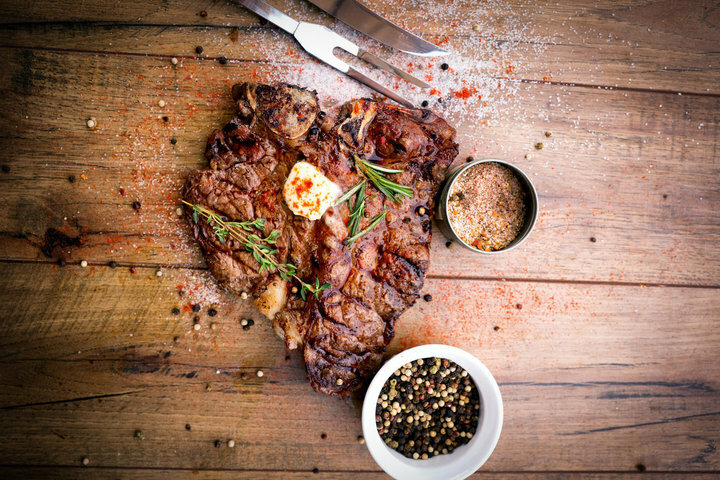 Steaks cooked to perfection shouldn’t be ruined by dull or inadequate cutlery. 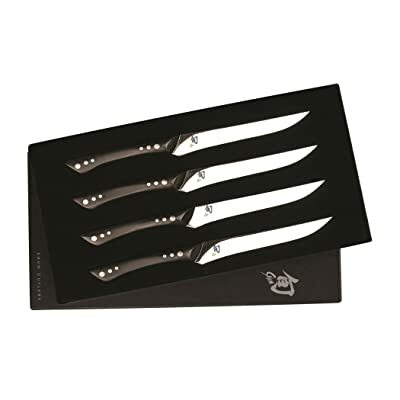 The Shun Shima 4 Piece Steak Knife Set is the ultimate set of knives for steak enthusiasts. 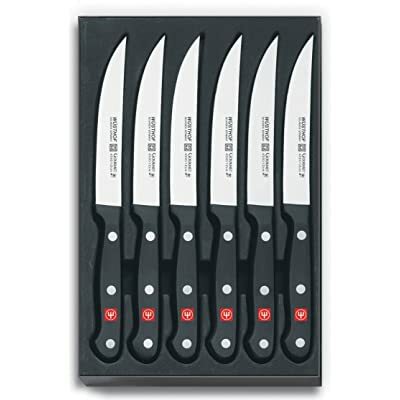 Gift boxed for a beautiful presentation, everything has been thought of in this elegant, ultra-sharp knife set. From the slightly curved blade for precision cutting, to the 16 degree razor sharp edge for effortless cutting; steaks retains more juices and flavor when the proper utensil is used. Less effort exerted and less fibers cut with each pass of the blade means more of the flavorful juices remain in the steak. Shima Steak Knives are made of Japanese AUS8A high-carbon stainless steel for longer edge retention. Each blade features a mirror polished finish which protects blades against corrosion. The full-tang construction of each handle provides perfect balance, while the slim, flat handle shape provides lateral control and prevents twisting, ensuring a better grip. Each handle is fully-riveted and made of ebony PakkaWood to protect against moisture and enhanced with steel rondels. Superior knives for the ultimate dining experience, Shun Shima Steak Knives will enhance every flavorful bite. This exclusive steak knife set from Wusthof has some of the best knives imaginable. This edition includes only four knives, all of them beautifully designed and feel amazing to hold. The great feeling of cutting through a piece of meat of any toughness with ease will be commonplace after you use these superb knives. These knives are what make Wusthof one of the world’s leading knife manufacturing brands, with this particular steak knife set hitting it on every level imaginable. A great gift or a lifetime investment idea! This steak knife set, in my opinion, is the best choice if you are looking for moderately priced steak knives. The French quality is impeccable, with the best of traditional knife-making practices being put into the crafting of those blades. These knives feel rustic, sturdy, yet are quite elegant. This is a best choice in the “up to 100$” category in my opinion. Steak knives come in sharp serrated blades and its wooden handles are very easy to use. During the Second World War, table knives came in to use. They were made sharp but required sharpening at regular intervals. Later on, the blades of these table knives were replaced with the stainless steel ones. They required no regular polishing and were very feasible to use. Heat treatment was then adapted to makes these knives sharp so that prolonged use can be continued. Steak knives are differentiated on the basis of its various parts. The tip of the knife is quite common among all. The cutting edge varies respective of its use. The spine and the heel of the knife remain similar in all. Steve knives can have different types of blades. Hollow ground, hollow edge, convex ground blade, taper ground, flat ground or chisel ground or straight edge are some of the common types of edge. Nowadays, in the modern day, steak knives are made of stainless steel and used both in table and kitchen usage. They vary in their shapes and sizes and each have their own specific reason for use. Mostly steak knives are used in kitchen for cutting purposes. The main thing about the knife is the blade. It must be sharp and shiny to give out the best quality knife. Knives used for cutting vegetables are always bit different than those used for cutting meat or fish. While buying, a person needs to know the use of the knife. 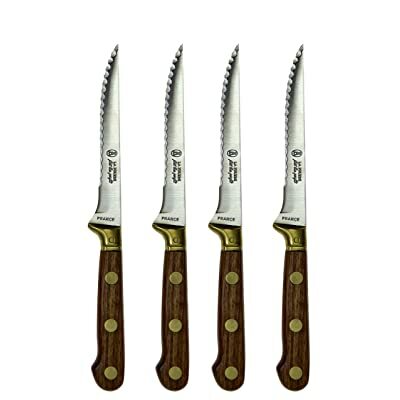 Steak knives for kitchen use are made up of good quality wood or plastic. Kitchen use is prolonged and these knives are made such than do not sedge. Steak knives in table purposes are not so much durable or finely made like the kitchen knives. Similar to the kitchen purposes, the steak knives on table also have wooden or plastic handles. While buying table knives, one should always remember that it should be durable and long lasting. The table knife should check out whrether it is easier to use or not. They are not so sharp bladed like the kitchen ones. 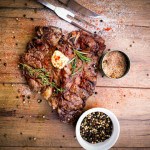 Two general things to know before choosing a steak knife are that they are meant to be used on a plate and not on a cutting board and that it must be good-looking. An elegant design and style is a must. A stainless steel steak knife with a plastic end is simply a no-no! The knife should have each and every inch well-designed. It also should have well-finished edges so that it can use only for the purpose for which it is meant. Next to look upon are the edges of the knives. Basically, a user should know which kind of knife is meant for what purpose. There are three kind of edges among steak knives- straight-edged, serrated edged and micro-serrated edged. Straight edged knives leave a clean neat cut on which it is used. Usually friendly on plastic or wooden plates, straight edged steak knives are mostly used. Serrated knives gives a little less perfect cutting than the straight edged ones. Meat cut polyhedron or non-uniform shaped are more preferred than the perfectly shaped ones. A slight dull-cut than straight edged ones but uniform than the micro-serrated ones, serrated ones are an example of bad designing. A perfect steak knife should have a stainless-steel blade made of the best quality carbon. The knife is meant to give a sharp, clean and recessed cutting. Steak knives look best and elegant in a good designed handles and thick steak to provide potential cutting. The knife must have a guaranteed period because in most cases the knives are irreplaceable. On overall basis, the steak knife fulfilling all these qualities are a must have in a culinary set! Steak knives are a friend of the kitchen. There are various types of stick knives and they depend on their different served purposes. Before buying, each type of steak knives must be noticed carefully for any kind of faults or defects. Different types of these stave knives have variable features. Materials used are different but sometime situations. While buying, an inexperienced people should be taught carefully about how to use and look for other definite. Steak knives, therefore, should be judged carefully before buying.